Offside of the TAM Vive TH. Integrated roof side fairings disguise the air conditioning and give the Vive a more imposing appearance. 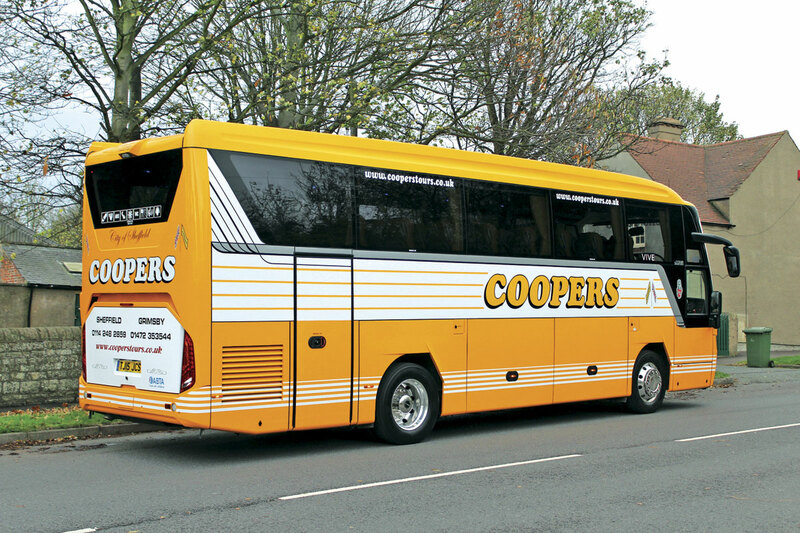 Coopers specified 38 recliners and a rear offside saloon toilet. The saloon from the rear. The cab and entrance area. The top loading dash mounted fridge. 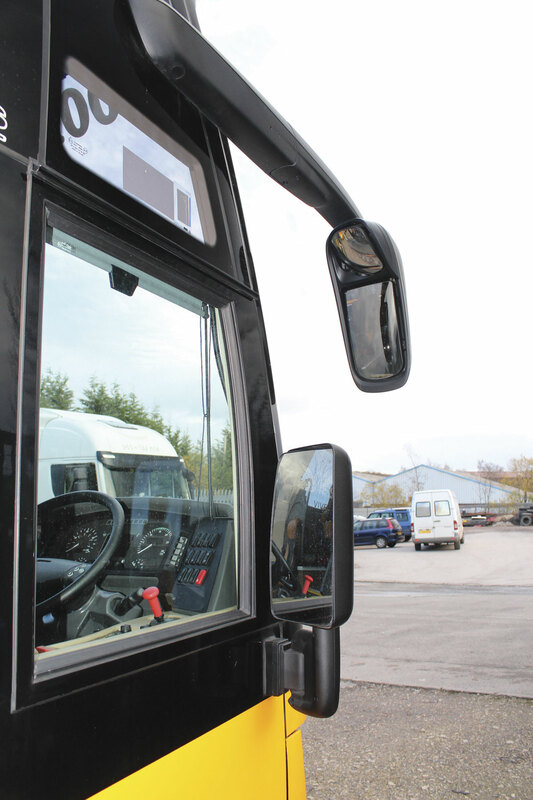 A powered drop-down monitor is provided at the front and there is a full width powered blind, though care has to be taken not to lower it too far or it obscures the nearside mirrors. Blue lighting illuminates the aisle step edgings. 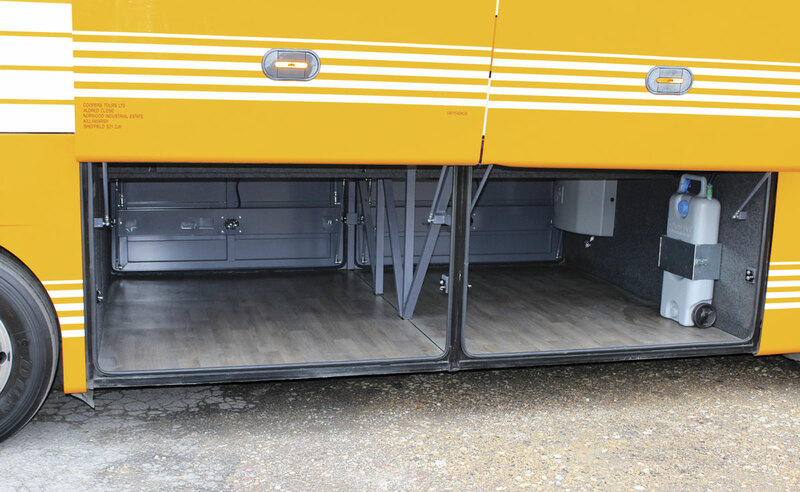 An AD Coach Systems servery is fitted to the left of the rear offside continental entrance. The toilet is to the right. 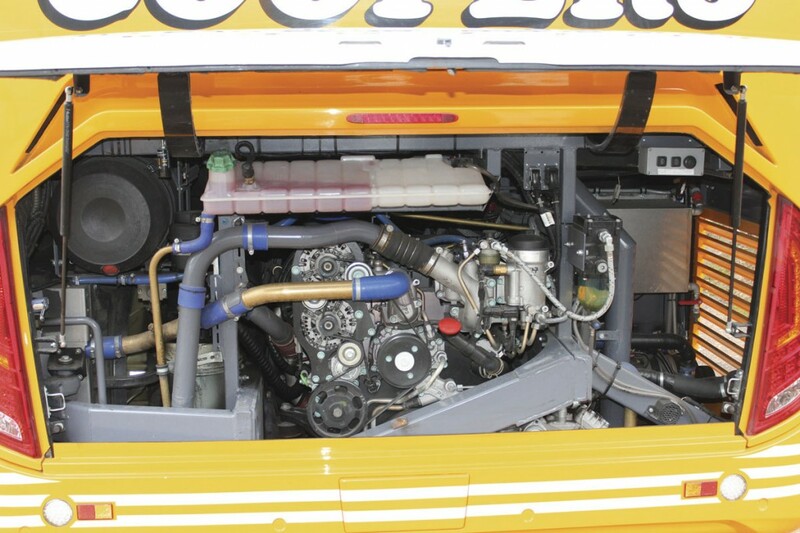 Quite a spacious engine bay houses the MAN D0836 LOH72 Euro6 unit. A large luggage hold is uncluttered and easily accessible through the cantilevered locker doors. The luggage hold from the nearside. Lights in the steps edgings are a feature of the continental entrance. All seats are mounted on podests either side of the sunken aisle. 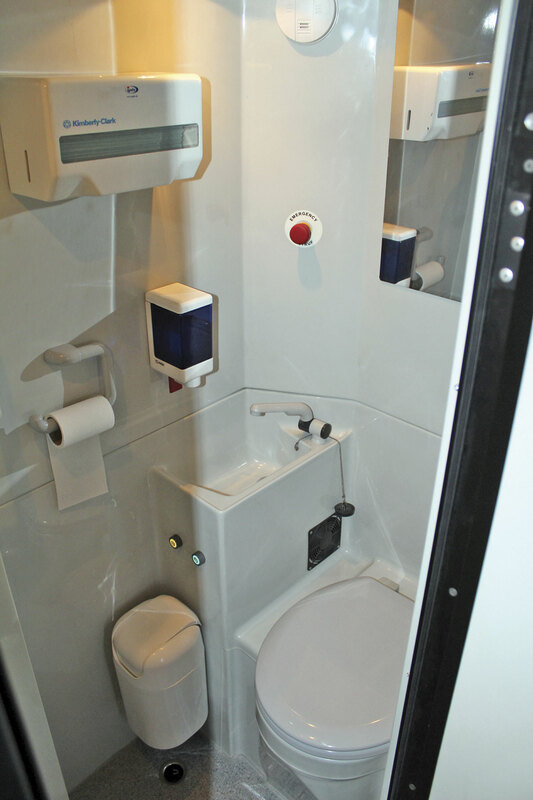 Changes have been made to the toilet compartment since it appeared in Birmingham and it is now an excellent unit. The exterior of the toilet compartment. 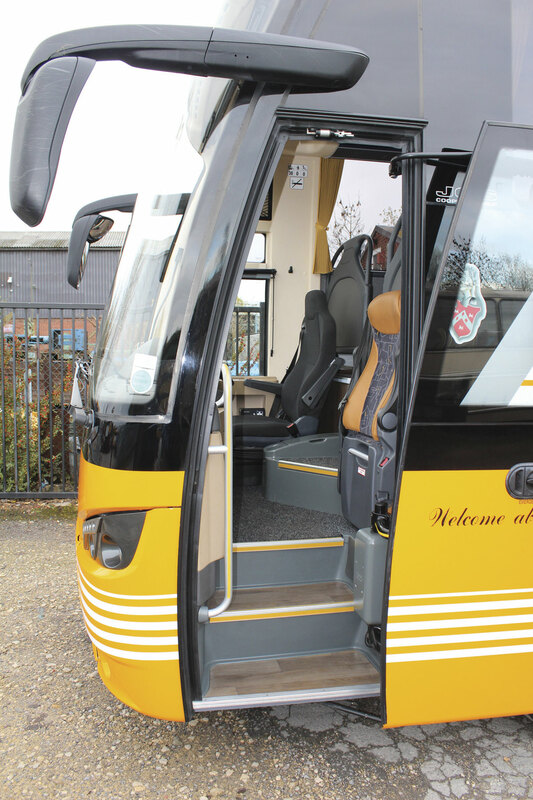 A balanced, well proportioned design, the TAM Vive TH is a short big coach. The entrance is well equipped with hand holds. Note the step from the platform to aisle at 45 degrees. Located at Maribor in Slovenia, TAM Durabus is a manufacturer of buses, coaches and commercial vehicles with a history that goes back 65 years. The main sectors in which it is involved are midi coaches for touring and schools applications and airport buses, though it is also branching out in other directions with plans announced for city buses and chassis systems. 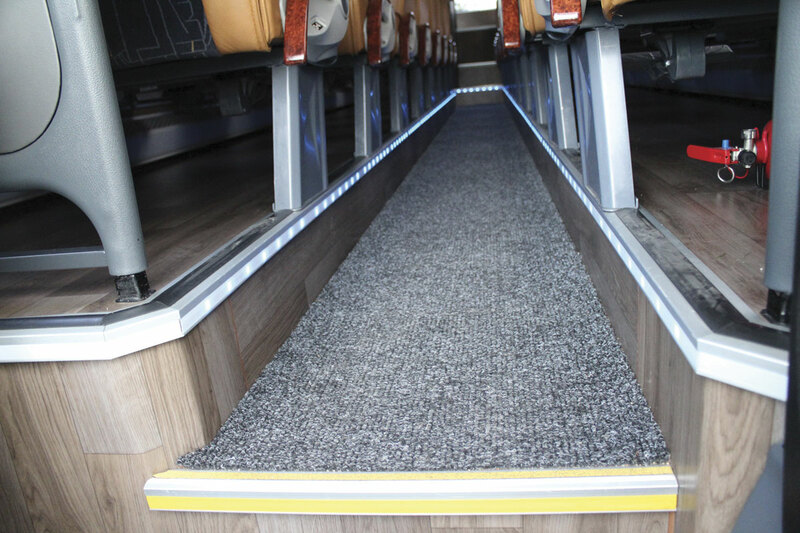 In the UK only one product has entered service thus far, the Vive TH high floor midi coach which is sold through Pelican Bus & Coach in Castleford. 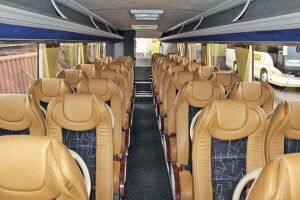 Pelican’s link up with TAM was as a result of looking at the coach displayed at Busworld Kortrijk in 2013, meeting the management and subsequently visiting the plant at Maribor. 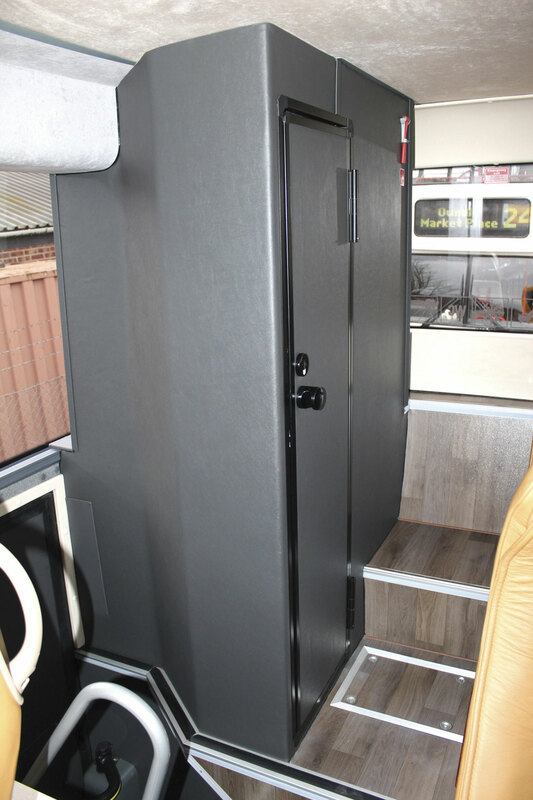 The first UK example appeared at the EuroBus Expo exhibition in Birmingham in 2014 in the colours of Coopers Tours where it was displayed entirely separately from the Yutong TC12 and TC9 products that Pelican majors on and in whose range it sits neatly between. 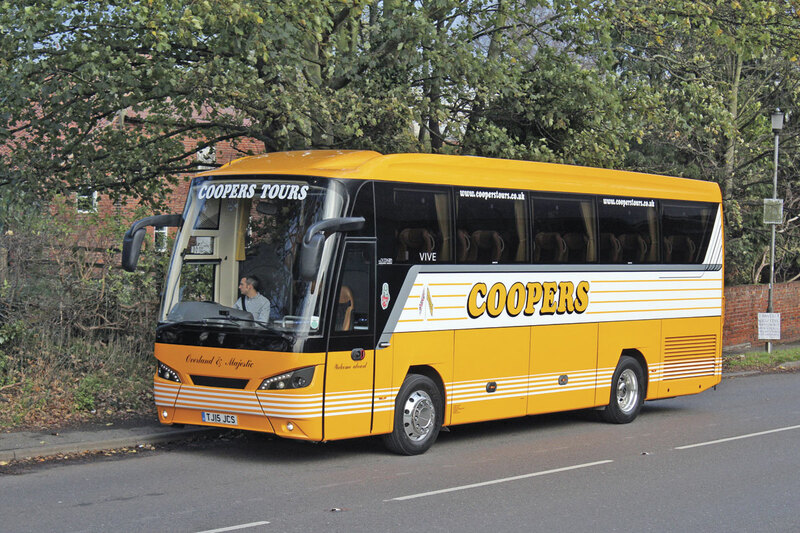 Coopers Tours have coach operations at Killamarsh near Sheffield and Grimsby in Lincolnshire as well as a truck business at Killamarsh. The bus and coach fleet numbers 29 split almost equally between the two depots. They have been doing business with Pelican since around 1982 when they first bought Foden trucks from them. At the time the operator could choose whether to have Gardner, Caterpillar, Cummins L10, Rolls Royce or Perkins engines installed and Coopers went for the Cummins L10, later switching to the 14-litre unit. They still have a 2005 Cummins ISM 420hp powered Foden that has done 1.2m kilometres without the engine being touched, a Hino bought off Pelican’s Bob Elliott after Foden closed and their latest acquisition, a DAF, was also bought through Bob. Apart from four secondhand purchases the whole of the 12 strong truck fleet was bought from Pelican. ‘Whatever Pelican sell, they support it well,’ said Alan. It is a very imposing and well proportioned design with a deep, raked one-piece windscreen and coves running the length of the roof sides to disguise the air conditioning unit. 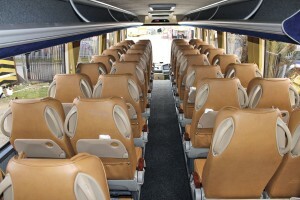 The result is a stylish coach which looks balanced and in no way over-bodied as some shorter vehicles can. Furthermore, the sense of style is carried through to a well finished interior with a number of quality touches. After the show it returned to the factory for further work that took rather longer to complete than had been anticipated. When this was finally completed, it returned to the UK and entered service with Coopers in June 2015. 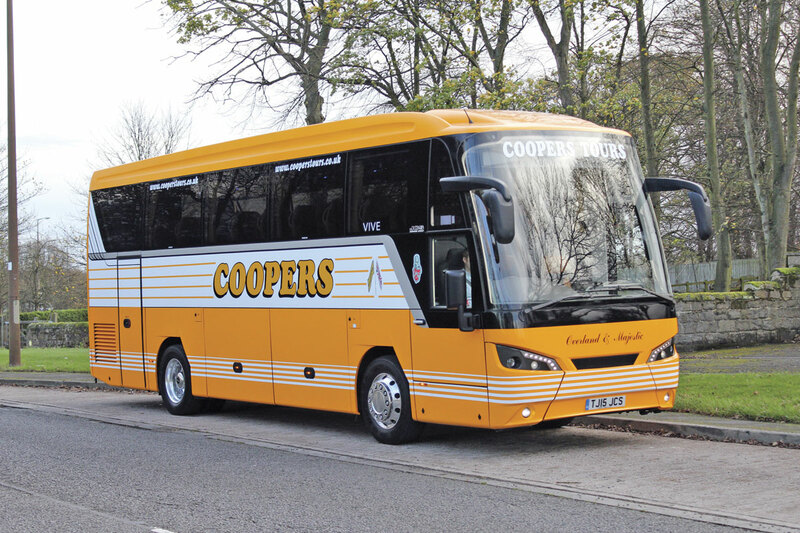 It was the first brand new coach that had been added to the fleet for six years since an 09-plate Scania OmniExpress, a model Alan believes is underrated. ‘It’s a cracking vehicle’, he said. Another model bought new in the past was a Polish built Autosan Eagle 1200, which has also proved a good purchase. The previous midicoach in the Coopers fleet had been a 2003 BMC Probus 850. Coopers had tried to run a BMC franchise for two years but, though they had some success, they stopped when they found they could not get support for the product. Of integral construction, the framework is constructed of welded square steel sections integrated with the chassis units. As you pass through the plug door, you are faced with a three step climb to the aisle, the second step narrowing slightly because of the protrusion of the dash. Handrail provision is good, with a substantial rail to the left that goes up and over the dash front, while on the right there is a hand hold on the bulkhead as well as one on the courier seat base. I liked the fact that the seat locks in place ensuring the hand hold is a firm one. The courier seat legroom is not ideal as there is no step to rest your left foot on and limited toe room for your right foot. The really appealing aspect of the dash is that it is trimmed in stitched leather, the upper section in a grey and the lower in a light beige colour. Within the dash top is a deep fridge, but this is not fully integrated because you have to raise the dash cover and then the fridge top for access. An unusual feature of the front section of the interior is the inclusion of two insets above the passenger door and cab which have criss-cross patterned netting across the lower section of the inset. Beyond the platform there is a triangular step to a flat, sunken aisle, the edges of which are neatly finished with aluminium running strips. The floor is covered in a wood effect laminate though the aisle and steps have carpets applied. Quite a number of seat options were offered and Coopers opted for Sege recliners with a useful degree of recline, lap belts and a lateral slide facility. Their specification includes armrests with wood effect veneer insets, leather magazine pockets, folding footrests and a grab handle to the side of each headrest. 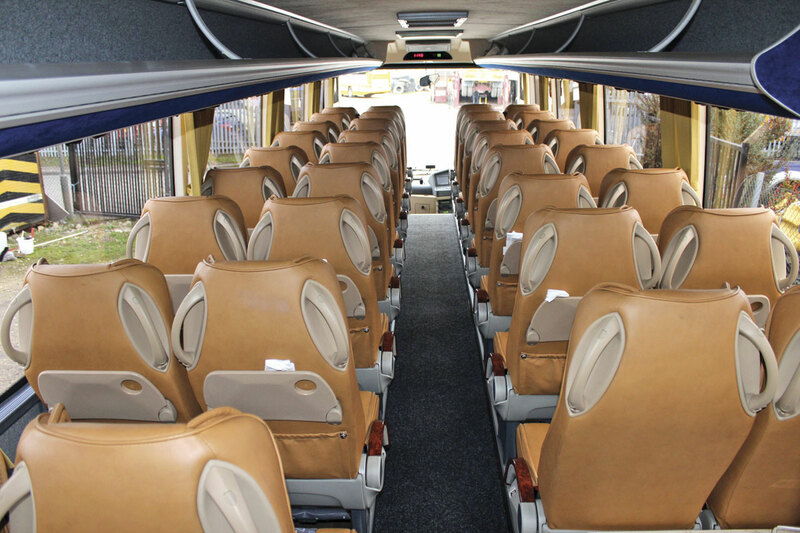 Trimmed in light brown leather to the side panels, the full rear and the headrests, they have padded side flaps with contrasting blue patterned moquette seat panels. They look attractive and I found them very comfortable. The side panel casings are trimmed in grey soft trim and yellow full draw curtains are fitted. Overhead the racks run the full length of both sides. 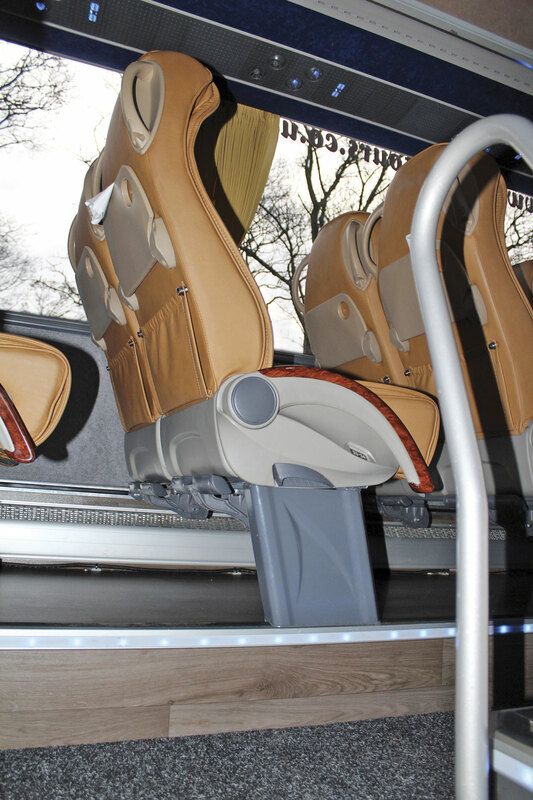 They have plastic moulded lower sections and each passenger has individual swivel ball light units, individual air vents and hostess and stop buttons. All lights are LED units. 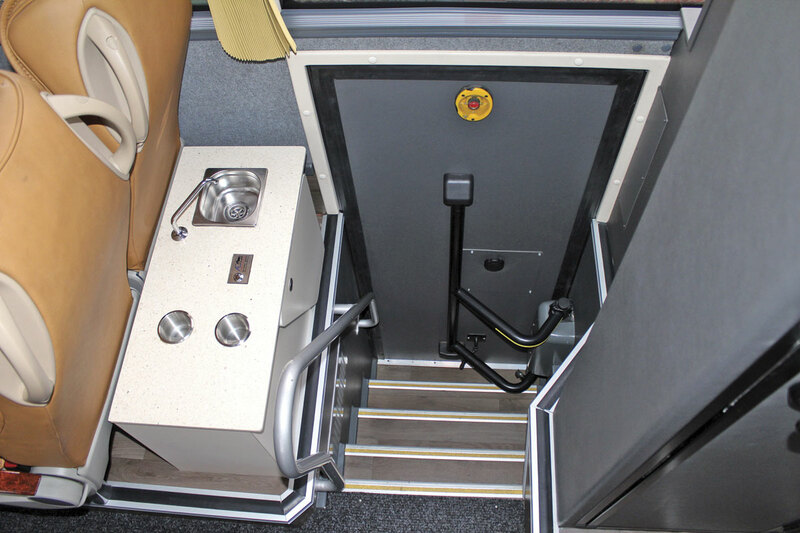 Ahead of the offside rear mounted saloon toilet is the continental exit which has five steps from ground to aisle. There is a good handrail to the right as you ascend and between this and the seat beyond is a drinks servery unit from AD Systems. The toilet itself is well appointed. 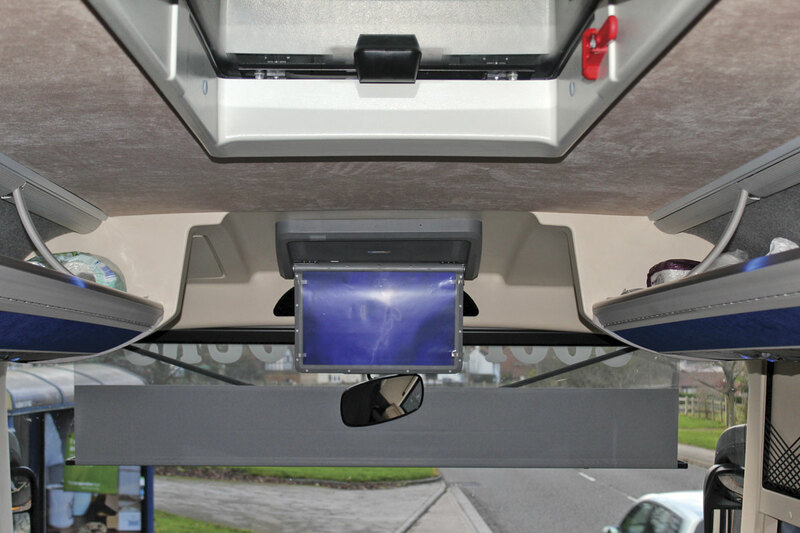 Other elements of the specification include an Autobus powered monitor that folds away within the front dome. The radio/tuner, CD and DVD system is from the Bosch Professional CCS range and there is a Bosch wander microphone mounted on the offside A-pillar, as well as a courier microphone located within a dash recess. Audiobus supply the satellite navigation system and reversing camera, the latter with a microphone facility so that you can hear if someone is directing you. Two clear glazed roof hatches are installed, one at the front and one at the rear, with the grille for the air conditioning in the centre. Air conditioning is by Eberspacher and there is a Webasto pre-heater located within the engine bay. ‘Drivers all like the driving position because it’s not cramped. They compare it with our last 35 seater, the BMC, which wasn’t the sturdiest. On a windy day the BMC would wander a bit and you were constantly correcting it, but this is solid like a 12m. The BMC had a lot smaller wheels; these are full sized’. 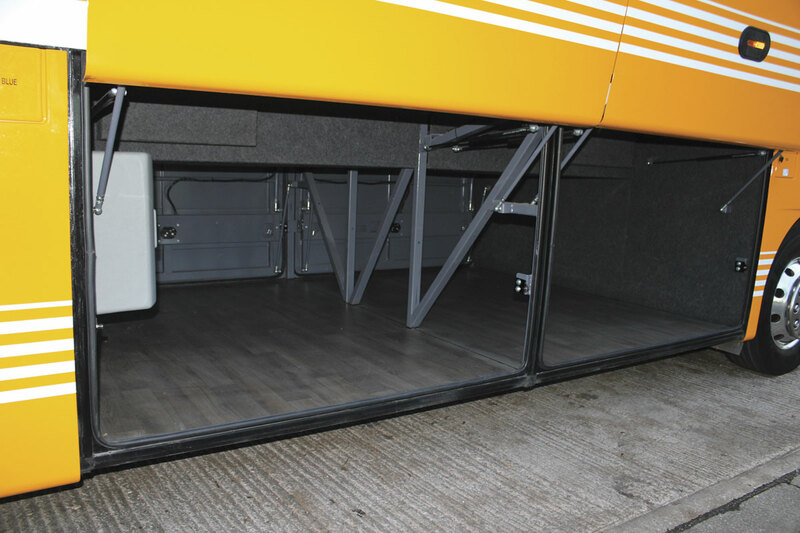 Underneath, luggage space is generous for the seating capacity giving eight cubic metres. With the unladen weight of 11,540kg the given luggage capacity is 760kg. 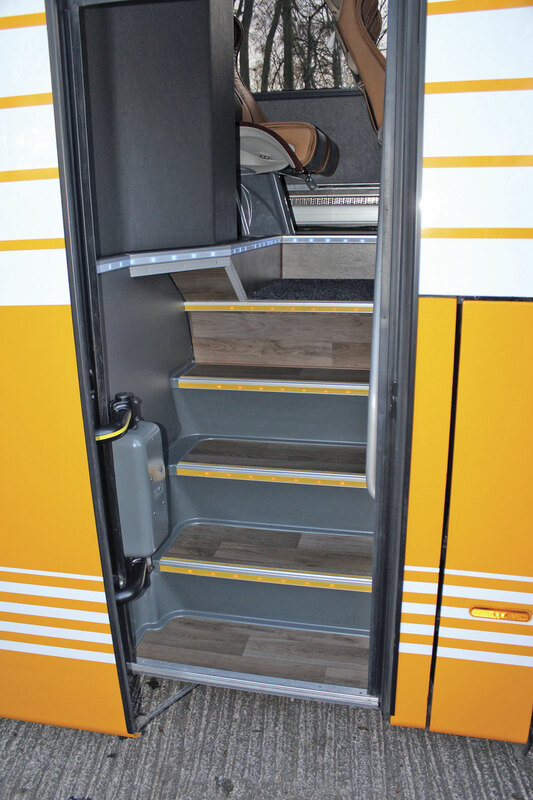 Wood effect vinyl is used to trim the luggage compartment. 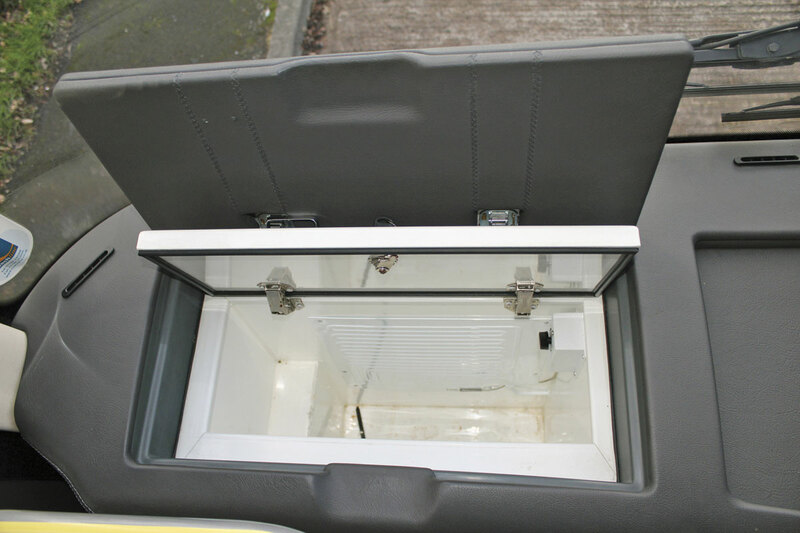 The electrical panels are both within the locker roof on the nearside, accessed by undoing two bolts. Both filling points are on the offside, the diesel towards the front and the AdBlue towards the rear. Mechanically, the engine is the Euro6 MAN D08.36LOH72 common rail, 6.86-litre, six-cylinder unit. This develops maximum power of 290hp/213kW at 2,300rpm and peak torque of 1,100Nm at 1,200-1,800rpm. The transmission is the ZF EcoLife GAP1200 six-speed automatic. The axles are both ZF with the RL75 independent system at the front and the A132 rigid unit at the rear. 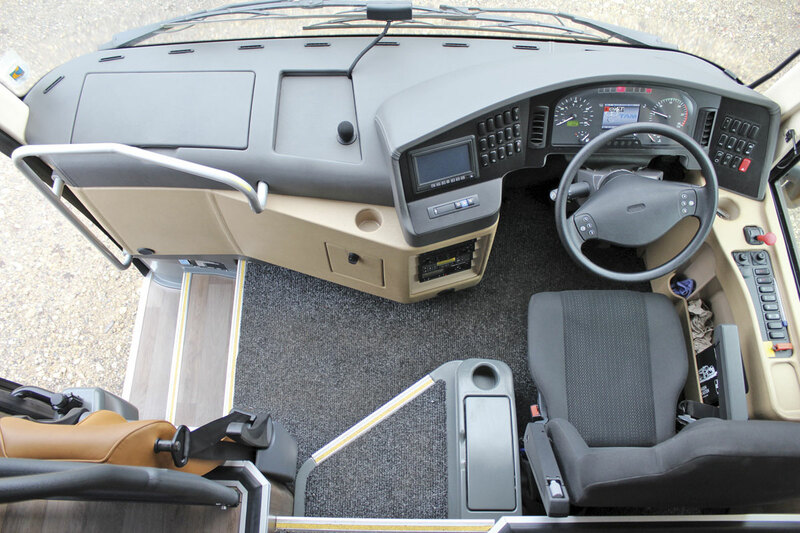 Steering is the ZF Servocom 8098 system with a 450mm steering wheel. The electronically controlled air suspension has two air bellows, two telescopic shock absorbers and two cross links at the front and four air bellows, four telescopic shock absorbers and two longitudinal and one V-shaped radius link. To experience the coach on the road on what was quite a windy day, I went out with Alan’s son Russell at the wheel. Russell told me that it had been so busy, he had only once driven it locally on a job with passengers and for our run the coach remained unladen. He agreed with what Alan had said about the driving position which was comfortable with everything to hand. Everything could be seen through the steering wheel including the centrally mounted dash computer screen which enables the volt meter, AdBlue level, air gauges, fuel, and other levels to be monitored from the driver’s seat. There is a full sized electrically controlled driver’s window on the offside and a fixed window in the upper section of the passenger door, though no kerb window. To the driver’s right is a useful and quite large storage console with an integrated moulded cupholder though this did not impede access to the air suspended driver’s seat, complete with armrests. A full width, single-piece, powered sunblind is provided and when fully deployed this does obscure the nearside mirror, though the sun would need to be very low before most drivers needed it to be this low. The dash display also indicates which gear is selected, with the green band shown as 1,100-1,900rpm. As soon as you are rolling it goes from first to second at around 1,500rpm and then the transmission shifts sequentially through to fourth, though you don’t feel the changes. On an incline it held on until 1,600rpm before changing from fourth to fifth and dropping down to around 1,000rpm at just under 30mph. On the flat it changed to sixth at 40mph at around 1,400rpm. On the A1(M), with the speed on the limiter, the TAM recorded 1,600rpm in sixth, holding that as we slowed to 50mph when gentle acceleration saw it change down to fifth and back up to sixth at around 1,700rpm. Russell told me that in normal driving there was no need for the kick-down facility but he had tried it to see what it was like, and it did what it was there for. ‘You can’t fault the braking, it’s nice and smooth,’ said Russell. On the first occasion he drove it, he had thought the retarder was not working because he could not feel it, but it turned out that the electronic braking and the intarder work so closely together that you can’t tell whether one is operating or the other. ‘They are so precise and smooth that you don’t feel them come in,’ he said. The only other MAN Coopers own is a Beulas Cygnus bodied R33 dating from 2008 and the cruise control system is a similar stalk mounted one. There is a very clear view of the mirrors, with one mounted low on the offside beneath the driver’s window as well as the main high mounted ones. The low one is particularly useful in traffic. All were very securely mounted with no flutter as we drove along and between them they left no blind spots. This was the more impressive considering the blustery conditions. Russell had never used the satellite navigation system himself but his uncle, Graham Cooper, has told him that it is a good one to use. A lane warning sensor system that makes the appropriate side of the driver’s seat vibrate as a warning is fitted, and this sometimes went off when there was no need for it to do so, including at least one occasion when the indicators were in use. On one occasion it could have been because it had been fooled by another line on the road but on others there was no discernable reason, an issue Russell admitted other drivers had mentioned. When you look at the equipment controlling it, mounted on the lower edge of the screen, it does appear to be quite close to the resting position of the windscreen wipers, but whether this is influencing the system I could not say. I was impressed with the remarkable lack of wind noise throughout our run. Only once as we headed north up the A1 did the wind catch the coach to the extent that you could feel it as a passenger and I am confident that it would have been at least as evident whatever we had been travelling in. From the passenger’s standpoint, it was very quiet. There is some road noise generated in the vicinity of the rear stairwell, possibly added to by the heater, but there isn’t much engine noise, virtually no gearbox noise and a little air conditioning noise but not much. Travelling on the unladen coach there were a few minor rattles of the sort that go way when people are sat in the seats and overall the feeling was one of solidity. Ride quality was smooth throughout. It remained stable in all conditions and even when sat in the front seats, where such feelings are usually the most evident, there was no fore and aft rocking. The view out from all seats is unobstructed. The only criticism I would have is of the rear nearside double seat. Firstly, the triangular moulding that obscures part of the window and impedes shoulder room is too large and, secondly, the double is located too close to the side. As there is an empty space between the aisle edge of the seat and the toilet compartment, the seat could be moved away a few inches from the window and the moulding, greatly enhancing comfort for the passenger sat there. I realise this solution would not be an option on fully seated versions but on the Coopers coach it would be a big improvement. Alan had earlier commented, ‘Passenger feedback is good. They all praise the seats and the lighting is good as well. People like the blue lights in the aisle which look attractive. We’ve not had any dislikes whatsoever, which is a good sign’. It may have taken a while longer to get the coach on the road than originally anticipated but since then it has been well behaved. There have been a couple of relatively minor issues, including a leaking door seal over the entrance door and a leaking locker door seal, the only other issue raised being that of noise through a grille in the rear stairwell that has been resolved. Over a 9,706 mile period, the coach consumed 863 gallons/3923 litres of diesel giving an average of 11.24mpg with a variety of drivers. Presumably that would further improve with more miles on the clock. Apart from the Coopers coach, Pelican has also supplied a batch of four Vive TH coaches to CCH Coaches of West Drayton, which has been part of Transdev since 2014. These are 41-seaters and do not have toilets. I asked Alan whether he would have another TAM in the fleet and he replied, ‘I think I would, though I’d like the Cummins engine. I drove a manual Cummins at the plant and the change was really good, really close like a Javelin. The ride is quite impressive.’ Were they to buy one, Pelican are currently quoting a retail price of £165,000. They are not currently holding stock examples and delivery would be between four and six months depending on the circumstances at the time. I’ve seen a lot of midi hopefuls over the years and seldom have they gone on to achieve massive sales. This one was something of a surprise because it was far more refined than I had expected, with no discernible compromise over a full sized coach other than in length and capacity. Nice though it is, the experience so far suggests it isn’t going to be a massive seller, with only five on the road to date. Pelican’s other midi, the Yutong TC9 was launched at the same event, albeit in a slightly different sector of the market, and has already gone on to win ten times as many orders. That could be because people don’t yet know TAM and as a manufacturer it isn’t doing enough to inform and convince potential buyers, or perhaps that other options such as the Irizar i6 midi, the Plaxton Panther Cub, the Sunsundegui SC5 and the Van Hool TX11 are seen as a safer bet, though even in these cases, the market is far from huge.